I would describe Anno 1800 as a 'one more go' kind of experience, except it’s not a game where 'goes' are really a thing. Sure, you can play individual scenarios in sandbox or multiplayer modes, but constructing a full-fledged city in Anno 1800 takes anywhere between 10 and 20 hours. That’s less of a go and more of a day. Nonetheless, it is a game you can luxuriate in to the point where you forget what time is. You can start cultivating a new resource in the early evening, then suddenly it’s midnight and your city has electricity and a whole new district to support that industry. It’s very good, basically. Anno 1800 harks back to the grander city-builders of the earlier Anno titles, while taking the impressive visuals and little innovations of the more stripped-down Anno 2205. It also has arguably the perfect theme for a city-builder, albeit one the game doesn’t quite explore to full effect. 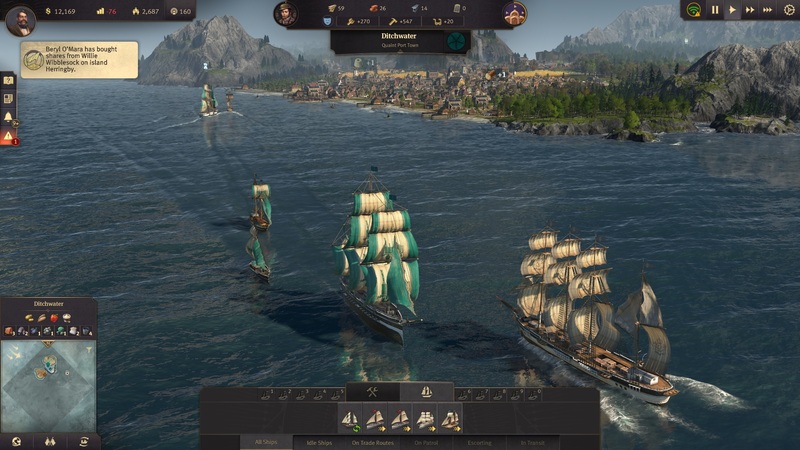 Despite the title, Anno 1800 is set roughly during the period between 1600 and 1900, a mashup of the colonial and industrial eras. Your job is to take a big chunk of idyllic European countryside and completely ruin it by building a massive, smog-spewing Victorian metropolis. The three game-modes (campaign, sandbox, and multiplayer) are structurally similar, although the campaign has missions baked into its sandbox designed to tell a specific (and, frankly, not very good) story. Whatever option you choose, a game of Anno starts out in a pre-industrial era, where your construction capacities are limited to establishing a quaint farming village. Constructing a prosperous settlement requires you to manage three key systems: production, population, and happiness, all of which are linked, and a deficit in one will likely affect the others. Of the three, happiness is arguably the foundation of your city. Over time your settlement will become populated by multiple classes of citizens, each of whom has a set of needs and desires that must be catered toward if they are to become productive members of society. Farmers are the base class, only requiring fish to eat and clothes to wear to keep them content. To make them truly productive, however, you also need to see to their higher wants, namely schnapps and pubs (if any real farmers are reading, feel free to confirm or deny that what farmers really want are schnapps and pubs). The happier your farmers, the more your population grows, which in turn unlocks new buildings. Once a particular farmstead reaches its maximum population, it can be upgraded into a worker’s cottage, which houses workers (duh) and unlocks the next tier of buildings. 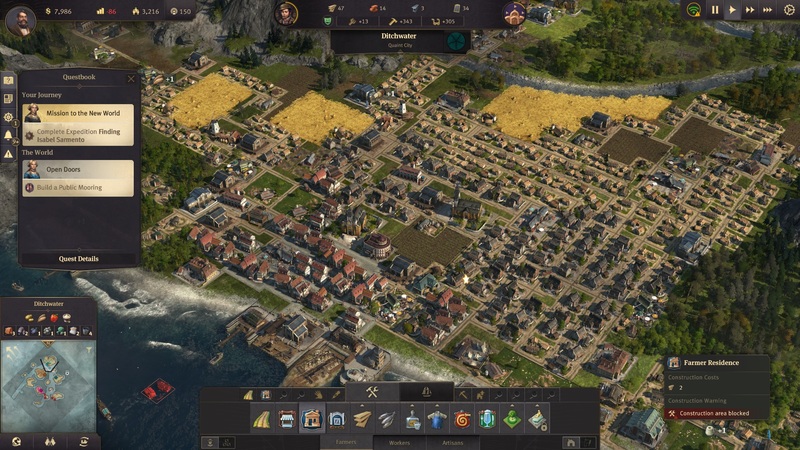 At the farming stage, Anno 1800 is a pleasant if simplistic affair. With workers, however, the game becomes gradually more complex and challenging. Workers have higher demands than farmers, requesting products like soap and sausages (that classic combination) as well as access to more public buildings such as schools and churches. These things, alongside the buildings that produce them, require harder-to-produce resources like bricks and steel. In turn, your brickworks and steel mills create pollution, which affects the overall happiness of your citizens. By the time you unlock the next tier of citizens – the foppish artisans – their needs are such that you must explore another continent to get them. 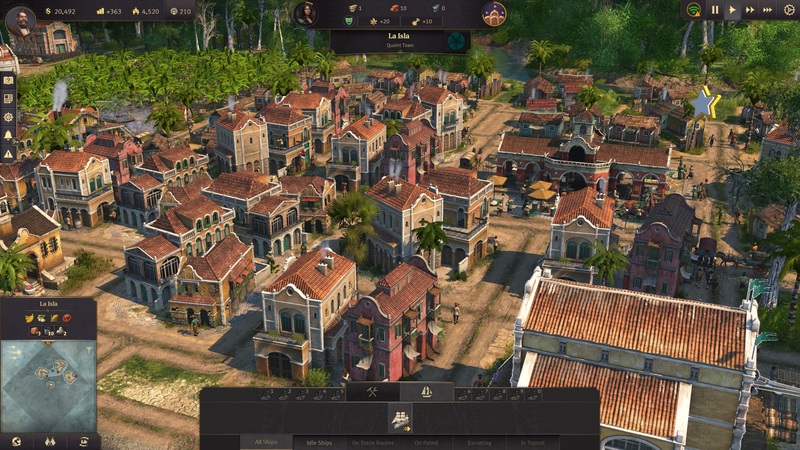 As with previous Anno Games, Anno 1800 involves supporting at least two separate cities simultaneously. Your New World colony is entirely distinct from your old-world city in its architecture, climate, and people. As with your larger city, you’ll need to establish basic production lines and public infrastructure support all the rum and cotton that you need to export back to the distant mainland. The way Anno 1800 expands and evolves in this manner is truly impressive. Visually your city goes from a simple wooden hamlet to a sprawling, technologically driven metropolis. A late-game city is electronically powered and crisscrossed by railroads. Your port becomes a concrete city of its own right, visited by fleets of giant sailing vessels and chugging steamships, while its piers and harbours are defended by massive metal artillery cannons. Your public buildings include museums and zoos that house rare animals and artefacts which you can deploy sailing expeditions to find, attracting tourists from all over Anno’s world. This expansion is not just visual but mechanical. 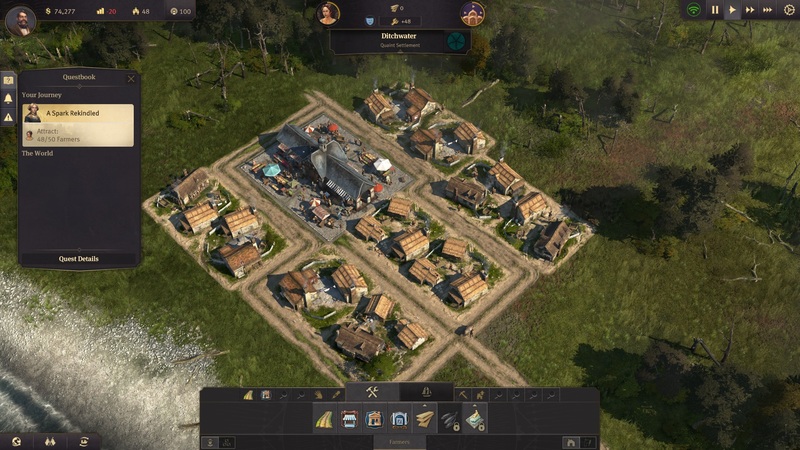 As Anno enters its late game, it becomes as much RTS as city-builder. You’re not alone in either the Old or New Worlds, and there are only so many islands to colonise. Accessing some of the more exotic resources may require you to take islands from other players (or AI in single-player). This can be done either through naval force, or by purchasing shares in an opposing island, which ultimately enables a hostile takeover. This more competitive side to Anno isn’t particularly complicated (naval combat, for example, is a standard RTS fare of whoever has the biggest/most ships wins), but on top of the city-builder it makes for an enjoyable palette-cleanser between your next urban construction project. 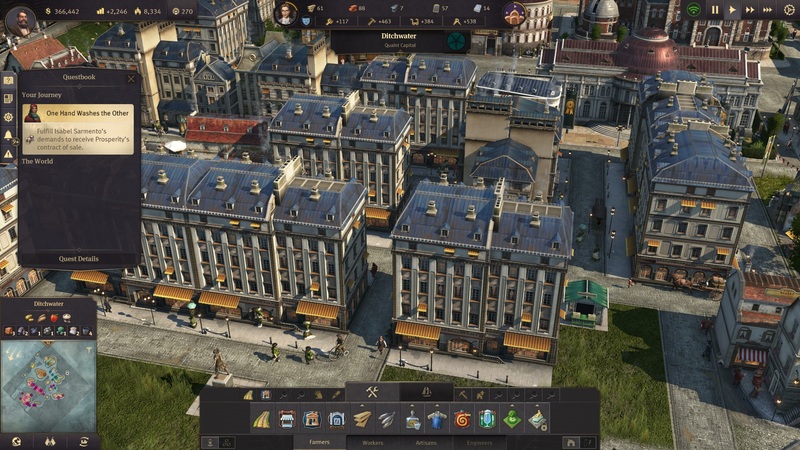 I’ve enjoyed most of my time with Anno 1800, but it isn’t free of flaws. By far its biggest problem is the abysmal (and frankly unnecessary) storytelling in the campaign. The writing and voice acting of Anno is comically bad, particularly the wince-inducing comments from AI players whenever they interact with you. Each of them is themed around a lazy national stereotype, such as a philosophical Oriental Queen, and a wizened, crotchety Irishwoman who is basically a potato wearing a flowery hat. 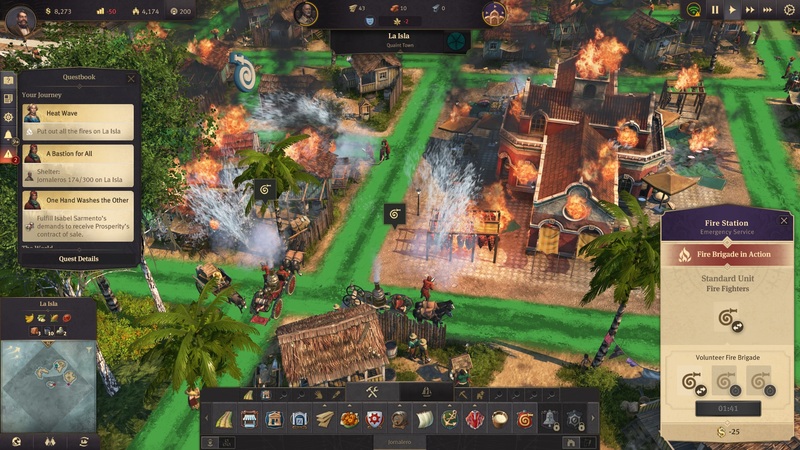 On the subject of sound, the game’s music is also not great, especially the score that plays when disasters occur, such as fires or sickness. Obviously, these are bad things, but the music conveys a tone that is positively apocalyptic. It’s all highly unsubtle and intrudes upon you enjoyment of the game rather than complementing it. 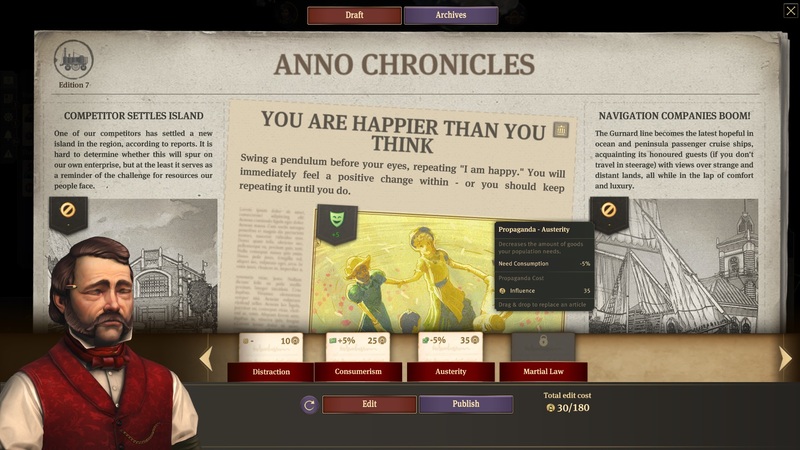 My other issue isn’t a flaw as such, but Anno 1800 has a very curious attitude toward employment. Obviously in the 19th Century employment was one of the biggest social issues. Mass-migration from the countryside to the city resulted in vast amounts of poverty due to the lack of sufficient jobs. 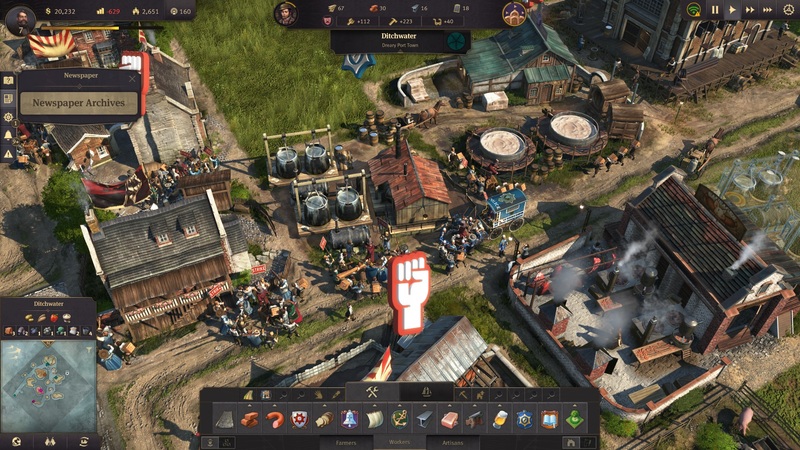 But Anno 1800 actively encourages players to create a huge surplus of unemployed citizens, as it doesn’t matter whether your people are employed or not. All that matters is that the available jobs are filled, while every household you create produces income for you regardless of its inhabitants’ employment status. Mechanically, this doesn’t really matter, as you still have to ensure that those citizens have all the things they need and want, and achieving that is complex enough. Nonetheless, it is weird considering the game’s theme. You’d think that having half your population jobless would be at least a little bit of a problem, but Anno is completely fine with it. Anyway, none of this stopped me enjoying what is an engrossing and wonderfully detailed city-builder. To my mind, it’s the most accomplished Anno game yet, and perhaps the most entertaining example of the genre I’ve played since Cities: Skylines. Launches a serious raid on Valve's platform. Takes away the two-game-per-year limit.